Saturday 24 May is World Fish Migration Day which aims to improve understanding of the importance of open rivers and fish migration. More than 250 events are being held around the world to celebrate the day. An Australian/Lao initiative that built the first fishway to allow Mekong fish species to migrate upstream to spawn is the site of a celebration on World Fish Migration Day in Lao PDR. A fishway (or fish pass) is a channel built around or through a weir to allow fish to complete upstream migrations. The fishway in Borikhamxay province in Lao PDR allows fish to move between the Mekong River and the Pak Peung wetlands providing them with access to vital spawning and nursery habitat, which has been limited by irrigation infrastructure since the 1970’s. The fishway, the first of its kind in Lao PDR, is the result of eight years of targeted research, backed by AUD$2.0 million (Kip 16 billion) of funding from the Australian Centre for International Agricultural Research (ACIAR), involving partners from Australia and Laos. 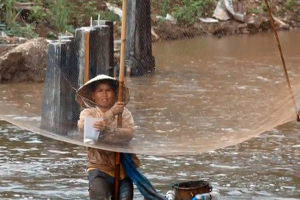 While the Laos problem is around ensuring that they sustain their fisheries, the Australian problem, in NSW for example, is about recovering the fish that have declined– so they can learn from each other and it’s a win-win. 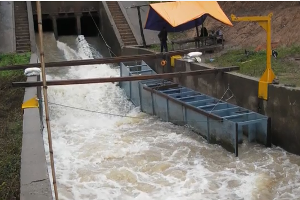 The fishway, which cost AUD$130,000 to construct, was completed using local labour and designs progressed by an Australian and Lao design team. Construction management was performed by the National University of Laos, while district and provincial liaison was progressed by the Lao Living Aquatic Resources Research Centre. Australian partners are Department of Primary Industries NSW, Charles Sturt University, Australiasian Fish Passage Services.